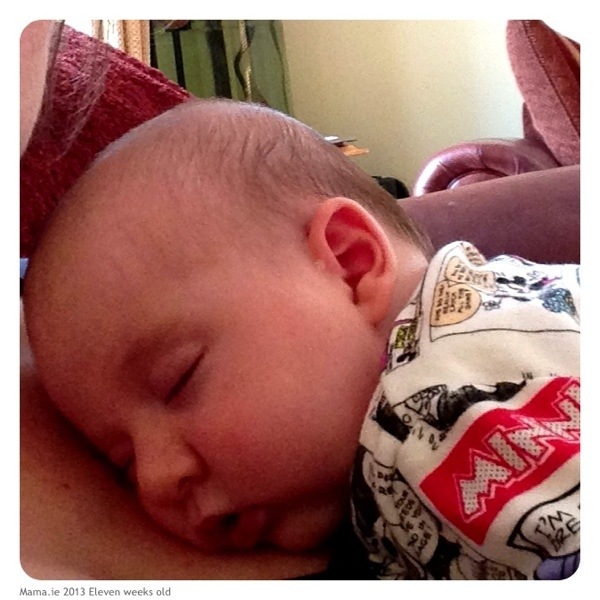 Eleven weeks old – we’re almost at the end of the “fourth trimester”. It’s quite obvious too when you look at Little Woman. Not a sign of the newborn scrunchiness left. She has filled out everywhere and looks twice the size she was at birth. She smiles and giggles with ease now throughout the day, and makes us laugh with her little coos and gurgles. Often I feel like she’s carrying out a conversation with me. She’s continuing to have a series of sleepy days followed by a series of wakeful days. Two days this week, she had minimal naps during the day. Thursday was probably the most extreme. Between 8am and 11pm, she had three naps, each just approximately 30 minutes long. I would have expected her to be exhausted as a result, but she wasn’t. She seemed wide awake and alert, taking everything in. And then when she did go to sleep that night, she slept for a nice stretch only waking once for a feed. In fact her night time sleeps are becoming more predictable than the daytime sleeps. She generally wakes for just one feed between midnight and 6am – often around 3am. It’s a quick feed with minimal fuss or winding afterwards. Usually the time between waking and being back in her cosleeper again is about 15 minutes total. At the beginning of this week, we travelled down to Dunmore East, to take advantage of the good weather and stay with my parents in a holiday home they had rented for the week. I was a bit anxious beforehand about traveling so far on my own with the two kids but I needn’t have worried. Little Woman slept for the whole journey, and Little Man was as good as gold, entertaining himself with his toys and books and trusty iPad, and giving me regular reports about his sleeping sister. The speed at which these newborn moments pass never ceases to astound me. Already those early feeding issues seem so far in the past. Pregnancy seems like a lifetime ago! Soon no doubt I’ll be saying the same about this small baby stage. So for now, I’m trying to make the most of it and take advantage of the sleepy baby cuddles whenever I can.